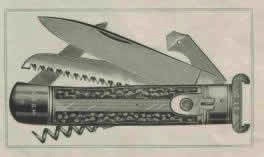 "Springer" is the traditional German term for pocket knives with a blade springing out of the knife's handle into the opened position by pressing down the folding lever. The lever combines the features of safety and release: it locks the blade in 'safety position' while the lever is being placed towards the top end of the handle and it releases the blade to fly out open while the lever is folded in backword 'unsafe' position; the release for closing the open locked blade works in reverse order. Besides classic style springers we are manufacturing switchblade knives which kann be released by using a press button (button release), by sliding the handle slab (scale release) or by pushing a pen blade (pen blade release). All three patterns are manufactured with different handle materials. The large pattern (11) can also be delivered with a drop point blade and with additional components. All patterns are manufactured with different materials of the handle. The larges pattern 11 is also available with clip point blade or with additional components. We are crafting our HUBERTUS Springer with folding guard under the name "The Guardian" in different options. While the blade is in closed position the guard made out of solid nickel silver abuts on the handle. When the blade is released the guard swings automaticly orthogonally in front of the handle. In the classic large pattern 11 HUBERTUS Springers are manufactured with additional folding components. For all knife enthusiasts who are looking for the very special and collectable knife! The classic release for a switchlade knife is a mechanisme activated by a lever or by a push button. The "Magic Knife" series is being activated by a pen blade release or by a cap lifter release. The small pen blade or the cap lifter blade aside to the automaticly opening master blade (switchblade) must be pressed down to release the switchblade. The Hubertus X-PRESS knife has a scale release (palm release). The upside handle slab must be moved forward at the bottom end to make the switchblade fly out in open position. This part of our website is currently under construction and this section will be completed soon. All knives presented in this section are only manufactured and offered for export purpose. We are not allowed and do not sell these knives to German retailers and customers as the German law on arms classifies them as prohibited items.Therefor these knives are offered to customers abroad from Germany only. Besides the standard knives described above we are able to manufacture knives with different handle slab materials. Please contact us if you have further questions concerning different types of handle slabs.